Chevron SECURA is a toughened laminated glass product designed for use in situations requiring an intruder resistant level of security and/or structural strength. Typical applications requiring high security and intruder resistance are police stations, remand centres, mental health facilities, juvenile institutions and some reception areas. Applications requiring structural strength include glass roofs, frameless balustrades, facades and glass pool fences. SECURA combines the strength of toughened glass with the safety of lamination, together with a super tough interlayer. SECURA can be manufactured with clear glass to maximize appearance and light transmission, or toned glass, or Low E glass, or included in an insulated glass unit for solar control and energy efficiency. SECURA is available in 12.56mm and 14.28mm thicknesses. SECURA has been tested and rated to Level 4 of AS 3555 (Testing and rating for intruder resistance). 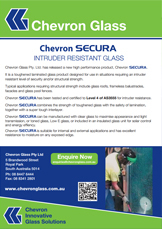 SECURA incorporates Chevron toughened glass, which is manufactured to AS/NZS 2208 – Safety glazing materials in buildings. SECURA is suitable for use in internal and external applications. SECURA has excellent resistance to moisture on any exposed edge.